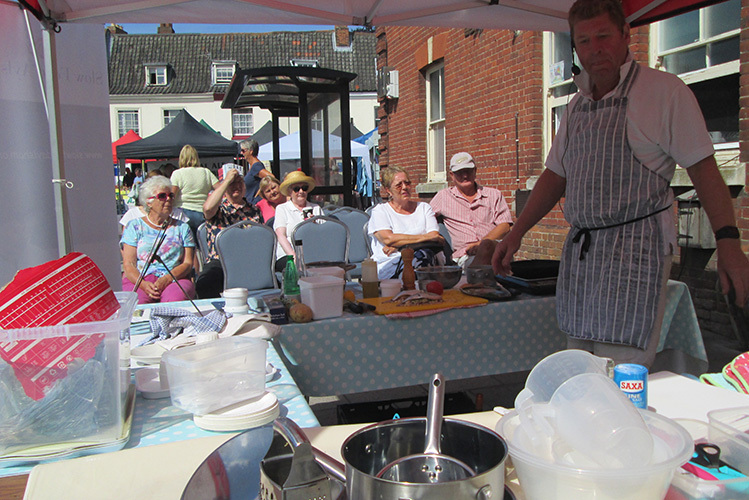 Mark Sayers, head chef at the Saracen’s Head, Wolterton, prepared two, quick and easy summer dishes at the Slow Food cookery demonstration in Aylsham (Sat 4 August). Visitors to the Farmers’Market were treated to mouth-watering mackerel stuffed with crab (left), with samphire, and a tomato and caper sauce, then a fried lamb steak with potato rosti and black pudding and apple sauce (below). Using fresh, local produce and hand-picked samphire, Mark demonstrated that what may sound like complicated recipes which might put people off are actually very straightforward. Each dish took about 20 minutes to prepare and cook. 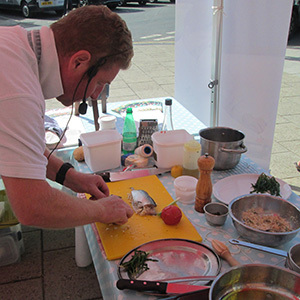 The next cookery demonstration will be by Steve Norgate, head chef at The Beechwood Hotel, North Walsham on Saturday 1 September. Mix breadcrumbs, crab,samphire lemon zest together. Spread on to one fillet place second fillet on top and tie with string. Seal in a hot pan and cook in the oven for 6 mins. Deseed and skin tomato. Chop onion and soften in olive oil add vinegar chopped tomatoes and capers. Seal lamb in hot pan and cook in oven for 8 mins. Meanwhile, slice apple and caramelise in brown sugar. 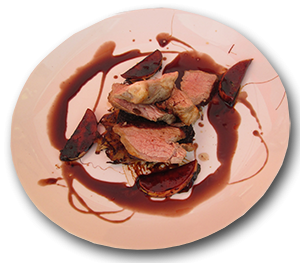 Reduce red wine and rosemary and add jus strain. Rest lamb for at least 3 mins before carving.